Themes provide great way to customize and freshen up look of Windows 7 user interface. There are number of Windows 7 themes with different design and style like Winter themes, holiday themes. 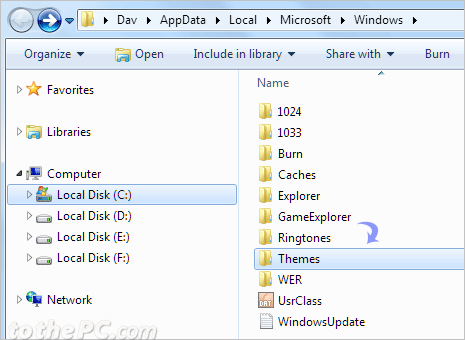 You can easily copy and backup themes data of your current Windows 7 PC. Further, themes backup can be restored on different PC with Windows 7 (or same PC, if you have reinstalled Windows 7 operating system). Replace <username> with actual username of your Windows 7 install. For example: if Dav is the username, then replace <username> with dav in above url address. 2. A window will open with lot of folders. Copy themes folder to any backup medium like USB drive, external hard drive or disc. 1. Open same folder location (as following) on your Windows 7 PC. 2. Paste themes folder to replace existing folder to restore themes data quickly. Windows 7 release launch date - October 2009 ?